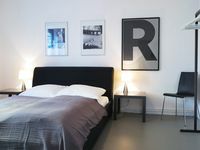 Properties in Hamburg-Mitte average 4.1 out of 5 stars. Absolutely stylish, modern and fully equipped. Property 7: Absolutely stylish, modern and fully equipped. Rotherbaum / 2 bedrooms, garden level, "Landhaus meets design"
Property 14: Rotherbaum / 2 bedrooms, garden level, "Landhaus meets design"
Property 17: Cozy apartment in Schanzenviertel for 5 people ★ "JOLLE"
New dream apartment up to 6 persons ★ Schanzenviertel ★ "BARKASSE"
Property 22: New dream apartment up to 6 persons ★ Schanzenviertel ★ "BARKASSE"
The apartment Luca is designed for a comfortable stay of up to 4 people and also equipped with free Wi-Fi. 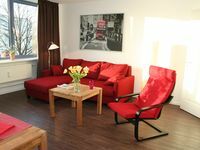 Property 36: The apartment Luca is designed for a comfortable stay of up to 4 people and also equipped with free Wi-Fi. Basic 3 bedroom place. Nice bedrooms. The kitchen was well equipped. Great place to stay if you are just planning on sleeping there. Not a lot of space to just hang out. Good location, easy access to public transportation, and restaurants nearby.